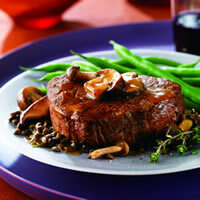 A variety of mushrooms combine with lentils, broth and shallots to create a tasty sauce for tenderloin. Combine lentils, water and 1/2 cup broth in medium saucepan; bring to a boil. Reduce heat to low; cover and simmer 30 to 45 minutes or until lentils are tender but not mushy. Stir in thyme; season with salt and pepper, as desired. Keep warm. Meanwhile heat large nonstick skillet over medium heat until hot. Place steaks in skillet; cook 10 to 13 minutes for medium rare (145°F) to medium (160°F) doneness, turning occasionally. Remove to platter; season with salt and pepper, as desired. Keep warm. Heat oil in same skillet over medium heat until hot. Add mushrooms and shallots; cook and stir 3 to 5 minutes or until mushrooms are tender and browned. Add remaining 1-1/2 cups broth to skillet, stirring until browned bits attached to bottom of pan are dissolved; bring to a boil. Combine cornstarch and Worcestershire sauce in small bowl; stir into mushroom mixture. Cook 2 minutes or until sauce thickens, stirring occasionally. Season with salt and pepper, as desired. Divide lentils among 4 serving plates. Top with steaks and mushroom sauce.